Two guys visit a casino for a day. One, Mr. Rich, decides that he'll gamble all of his $200,000 in accumulated lifetime wealth at the slot machines. His friend, Mr. Poor, makes the same decision, and puts his much smaller lifetime horde of $20,000 at risk. At day's end, the house predictably wins. Mr. Rich winds up with $140,000, while Mr. Poor comes out with $10,000. Who got hurt more that day? This not a trick question — unless you either work at the Pew Research Center or are a member of the establishment press. Anyone with an ounce of sense will answer that Mr. Rich, who lost $60,000, suffered far more than Mr. Poor, who lost $10,000. But if you're at Pew or with the press, you'll argue that Mr. Poor suffered worse losses that day by dishonestly claiming that the wealth "gap" between Mr. Rich and Mr. Poor actually grew. How can the gap between the two possibly have grown? Obviously, Mr. Rich entered the casino with $180,000 more than Mr. Poor, but came out with $130,000 more. The gap between the two, as any reasonable human being who understands the word's dictionary definition would conclude, shrank by $50,000. A "gap" is "a wide divergence or difference; disparity"; please note, not "a degree of disparity." That's not how Pew and its propaganda relay team in the press want readers to see it. Pew's envy-obsessed view is embodied in two brief reports, one on race and the other on class, published last month. Their work was based on the organization's review of the Federal Reserve's recently released, disastrous news-bearing Survey of Consumer Finances. Pew's fevered view is that when the pair began their day, Mr. Rich had ten times as much money as Mr. Poor. But at the end of the day, he had 14 times as much. Therefore, despite his $60,000 in losses, Mr. Rich really ended up better off. Somehow, I don't think either Mr. Rich or Mr. Poor would agree. Looking at the past six years, Pew's chart closely parallels the quiz. In 2007, inflation-adjusted median white household net worth, i.e., assets minus debts, was $173,300 greater than black household net worth. During the next six years, though the graph's distorted format conveniently conceals its severity, white households took a hit of $50,600. 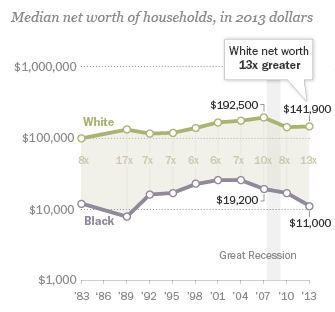 Meanwhile, black household wealth declined by $8,200. The wealth gap between the two groups fell by $42,400, from $173,300 to $130,900.